After doing the research with the RIAA, Boston's self titled album is still the second highest selling debut album behind Guns N Roses' Appetite for Destruction. Over 17,000,000 million copies of the album have been sold and is slowly closing in on the 20,000,000 benchmark. this is has long been one of my favorite albums and it still holds up almost thirty-seven years later. The album reached gold status in just three weeks and platinum in just over three months. By 1986 Boston had reached it's ninth platinum certification and its seventeenth in 2003. 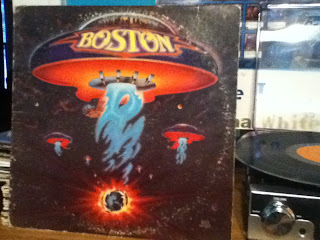 At the time of its release Boston was the fastest selling debut album of any American musical group. Three of the eight songs broke into the Top 40 and the entire album still sees regular air play on rock radio stations across the country. Boston was formed by Tom Scholz who has such a strong perfectionist personality, that he could have caused the album to have never been made. Scholz worked on the demos with vocalist Brad Delp and drummer Jim Masdea using his home recording studio. When the demos were picked up by Epic, the company insisted that Scholz record the album in a professional studio and Scholz refused, he wanted absolute control over how the songs were recorded and sounded. Epic was losing patience with Scholz when producer John Boylan decided to run interference. While Boylan had the backup musicians record at the studio in California, he was using that to cover for Scholz who was recording his multitracks for the album back home in Massachusetts. Even when it came time for the album to be remastered for compact disc, Scholz refused to allow Sony to do the work and did the remastering himself. This also resulted in copies of Sony's remastered discs being pulled from stores in Canada. The most successful single from the album was More Than a Felling which peaked at number five on Billboard's Top 40 but that and both Peace of Mind and Foreplay/Long Time can be debated to be Boston's most well known song. Despite the album's longevity and success, it continues to be underrated or forgotten as one the best rock albums of all time.